Can Some MS Patients Safely Stop Taking Medicines? Multiple sclerosis is an often disabling neurological condition that affects about 400,000 people in the United States. People with MS can develop a wide variety of symptoms, including vision problems, fatigue, pain, and loss of coordination. 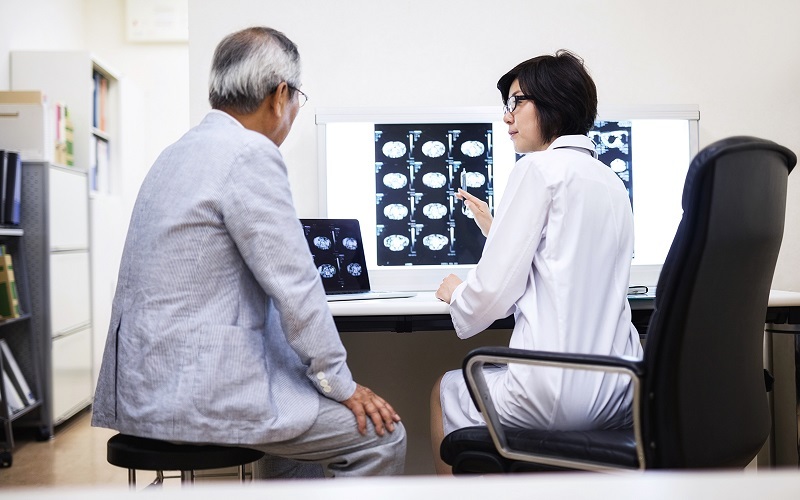 The disease is diagnosed by a thorough examination that may use magnetic resonance imaging (MRI) to detect damage, or lesions, in the brain and spinal cord. The majority of people newly diagnosed with MS go through periods of relative health followed by episodes of new or worsening symptoms, referred to as relapses. Since 1993, disease-modifying therapies have been available that can lessen the frequency and severity of relapses and prevent new MRI lesions. The Food and Drug Administration has approved 14 drugs to treat the symptoms and slow the course of this relapsing-remitting form of MS.
A PCORI-funded study is now testing whether some patients, after years of successful treatment, could safely stop taking those drugs. Why is this an important issue? The average annual wholesale cost of the drugs is $90,000. Some of the treatments are taken orally, but others require injections. Most have side effects, some of which can be serious. “I give myself a shot three times a week. I don’t want to do that for the rest of my life,” says Robin Beland, MBA, a vice president of sales at a technology company, who was diagnosed with MS around 20 years ago. Her neurologist, John Corboy, MD, of the University of Colorado, Denver, says patients constantly ask, “‘Hey doc, how long do I need to take this?’ We really have very little data to answer a very common question,” Corboy says. John Corboy, MD, of the University of Colorado, Denver, talks about patients' roles in his PCORI-funded study. So, he and a team of both researchers and other members of the healthcare community have launched a project to begin to answer that question. The study will recruit 300 patients with MS at 15 centers across the country. The patients in the study have been continuously taking MS medications for at least five years with no relapses or new lesions. Half of the participants will be randomly assigned to stop taking their medicines, and the other half will continue. The research team will closely monitor the patients for two years, performing MRI scans and tracking symptoms, to see how the patients who continue taking the disease-modifying therapies compare to those who halt their medicines. Although it is important for patients to continue in their assigned group at least until they have a new relapse or MRI lesion, all participants will retain the right to stop, restart, or change their medicine should they feel that is appropriate for them. I give myself a shot three times a week. I don’t want to do that for the rest of my life. It’s possible, Corboy says, that Beland, who is 55, and others are getting little or no benefit from their medications, while still experiencing side effects. Beland plans to sign up for the study. “I do MRIs yearly, and I don’t have any new lesions. I don’t know if that’s because of the drug or not,” she says. She’s willing to risk having a relapse if the study randomly assigns her to the group of the patients who stop taking medicines. “If I go off the medicine and something happens, then I’ll go back on,” she says. PCORI has funded seven patient-centered comparative clinical effectiveness research studies, totaling $26 million, about multiple sclerosis (MS). Two of those studies compare the pros and cons of drugs to reduce MS attacks or slow the disease’s progression. Another assesses whether patients with MS in rural and low-income areas benefit as much from rehabilitation therapies provided via telehealth as they do from clinic-delivered treatments. For more information, see our fact sheet and a list of projects related to MS. You can also learn more about other PCORI-funded projects on MS in previous blog posts, When a Clinician Becomes a Patient and A Multifaceted Disease Requires a Patient-Centered Response. Learn more about the former post’s guest author, Stephanie Buxhoeveden, here. Corboy’s team is getting ready to enroll patients at 15 study sites, three of which are supported by funding from the National Multiple Sclerosis Society. To gauge the likelihood of success in recruiting participants, the team did a preliminary survey asking patients whether they’d consider joining such a study. There could, of course, be a gray area in the results, where patients face a slight risk of relapse or lesion if they stop treatments. Each patient and doctor would then need to weigh the options together. Patients and other stakeholders have been involved from the beginning of the study through two stakeholder advisory committees based at the University of Colorado and the Cleveland Clinic, one of the study sites. The advisory committees worked intensively on the language in questionnaires to ask patients about how satisfied they are with their treatment or lack thereof. “Ultimately, patient satisfaction is the bottom line,” Corboy says. Editor's note: At the time that this blog post was published, Diane E. Bild, MD, MPH served as associate director in the Clinical Effectiveness and Decision Science program. Dear Angela, thank you very much for your comment. I would love to know more about this study. I was told I had ms in 2007 but had Lyme in 2004. I chose not to take meds but in 2017 started having more trouble and after meeting a new neurologist, I chose ocrevus infusion. I don’t do meds well and having side effects. But going to try for awhile. I’m really not wanting to take this long periods of time. I’m 51 now and in good health otherwise. I’ve alwsys taken vitaminD and believe other herbs have helped me a long the way. I would love more information. Hi, Beth, thanks for reading. Hi, Beth, thanks for reading. We encourage you to find out more about this study by visiting the project page and clicking the green box in the upper right corner to receive email updates. how are you now? I started taking Copaxone but I feel like crap and have been thinking of getting off. I am planning to come off MS drugs for pregnancy. I have had one neurologist say I could have 6 months off drugs before being sent to a fertility specialist. I have another neurologist that told me I couldn’t have cushion time and had to start trying immediately. Is there any reason to think that 6-8 months off drugs to allow for pregnancy would be a concern? I haven’t had new lesions in years. I had 1 relapse 3 months after having my first child and there is no sign of that relapse on my MRI’s. Hi Angela, thank you very much for your comment. After discussion with my neurologist, I plan to stop my plegridy when my supply runs out in 6 weeks. I was diagnosed in 1990. I haven't had any lesions or new problems in 5 years. I am now 61. He is going to repeat MRI 6 months after last dose. I am interested in what this study finds. Hi Jane. Thank you so much for your comment. Diagnosed TM 15 years ago then MS 10 months later. Stopped interferon 8 months ago. No attacks in many years. I do not like the interferon side effects . I am interested in the study. Thank you. Hello. Thank you so much for your comment. If you'd like to find out more on this study, you may do so here. Hi I was diagnosed with MS six years ago. Tried three different medications. They made me feel worse. Now I'm having problems with sciatica very bad and back hurts really bad. My husband is get very fusrated do you have any advice for me. Hi, Gloria. Thanks for your comment. We recommend talking to your physician about what treatment option might be right for you. I was diagnosed with Ms at 45, I am now 54 soon to be 55 in July. I started with Copaxone on about 3 years, then gilenya on about 7 years, Ms is progressing, medicines never stopped the lesions from forming on my brain. I haven't had an MRI in about 4 years and in between neurologists, but I'm in no rush. There's nothing they can do for me. My initial diagnosis was six nerve palsy in my right eye. I've never had any problems with my vision since. Secondary progressive MS. I only had one relapse when I was first diagnosed. I'm now using a scooter full-time. I went from normal to cane to scooter Within a year and that was after I had been on the medication for 5 ears. I stopped gilenya in September because I didn't think it was doing anything. I'm also a breast cancer survivor and did a round of chemo 2007 before starting the MS medicines . Good luck with your study. I wish I was in Denver. interesting about the age - and that the meds work less as you get older. I am not currently on meds, I am in the process of changing doctors. I want my doctor to discuss these types of things rather than be a statistic of how many patients he has on this medication and % of no new lesions or symptoms. It is confusing to me how a medication that drastically reduces your white blood cells can be good for someone - especially as we get older? I have had RR MS and am now 66! I have been on Avonex for 20 yrs. and I do not like loosing 24 hrs every week, due to the side effects and the increasing cost of the medication, is becoming of great concern. I live in Oregon and I am applying for the study that stops the meds and watches, closely, your personal response! I am 67 years old and was diagnosed with MS October 19. 2010. I take interferon medication, which I inject three times per week. When I receive MRI'S, there are no new lesions. I want to be medication free. I was being treated by infusions for two years. This was not good for me. I would love to be included in this study. Am 61 y.o., was diagnosed in 2008. Have been on Rebif ever since. Since my very first diagnosing MRI, I’ve never had an exacerbation or any changes in my MRIs. Whether that is due to Rebif or not, I have no idea. Hello, Kaye. Thank you for your comment. If you'd like to find out more on this study, you may do so here. Started taking Avonex in 2000 when first diagnosed with MS. I have taken Plegridy the last four years. Now at age of 71, side effects was the reason my doctor stopped the medicine. Apprehensive about being on my own, but will try. I was diagnosed 14 March 1997 , 27 year old. Now I am 48 , stopped my meds 3 years ago. I work 50 hours a week, haven't a MRI in 3 years. I got tired of 3 shots a week or day. Hi, Aron, thanks for your comment. We encourage you to find out more about this study by visiting the project page and clicking the green box in the upper right corner to receive email updates. I was Dx in 2012 and have been on Copaxone, tecfidera and now Gileniya. Gileniya has helped my MRIs stay stable but my blood counts are too low to continue. I have decided to go medicine free until my I see a specilist in November. I know I am rolling the dice but hoping for the best! If there were a trial I would be very interested. Do you know of any similar studies being conducted in other areas of the country? I live in Nashville, TN and we have an MS clinic here through Vanderbilt Neurology. I only had one episode which led to diagnosis. After 5 years with no episodes and no new activity shown on MRIs for that period, I came off of Avonex. I would like to know more about long-term risks for being off meds. I would participate in a study, if it were in Nashville, TN. Hi Charlotte. We don’t have a related funded project in your area at this time, but we encourage you to stay up to date on this study by visiting the project page and signing up for updates in the upper right corner. Our topic page can provide you more information on PCORI’s multiple sclerosis research portfolio. I was dx 11/2013 with RRMS and was on Copaxone since. I stopped taken the medication about one year ago and have no new lessions signs or symptoms. I was diagnosed with MS in 2001 by Dr, Barbara Guisser in Tucson AZ. I started on Copaxone right away and took it faithfully until last September. when I switched to Aubagio. I have NEVER had a relapse nor a change in my MRI’s. I will be 75 yo this year and have decided to stop taking all medications for MS.
Hello, Judith. Thank you so much for your comment. What was the outcome of the study about those who stopped taking their MS drug? Thank you! Hi, Nancy, thanks for your comment. This project is ongoing, so there aren't results yet, but we suggest signing up for updates in the upper right hand corner of the project page to stay informed on the latest. I was diagnosed with RRMS in 1996. I started on Copaxone injections on April 15, 1997 and have been on it ever since. I will be 65 next month. I would love to stop the injections and have some fear of stopping since I have been very very stable for nearly 15 years. But to not have the cost and the trouble is very appealing. Your study is of critical importance to so many of we Baby Boomers who may have been diagnosed early but are aging without a roadmap on our MS. I was diagnosed with RRMS in 2002 and have remained on Copaxone/Glatopa ever since. My neurologist recommends that I end injections at age 65, in just a few months as studies were showing medication might not be effective. A recent brain MRI showed no new activity. I would like to stop but relapse or a shift to Progressive is frightening. Some studies seem to indicate the odds of this shift are relatively high. Thank you for this study. Are you still accepting participant applications? Thanks, everyone, for your comments. We suggest signing up for email updates for news on this project by clicking the green button in the upper right corner on the project page. This is a good idea. Perhaps a long trial of treatment followed by observation would be best. Especially since the prices of the medicines are so high these days. Perhaps insurance companies would support doing the research.